At Popham we are able to offer both top quality huacaya and suri stud males with outstanding genetics and proven show records. We can do drive by (DB) or mobile (MM) matings according to your requirements; see individual animal details for fees. Discounts on multiple matings are available. Mileage charges on mobile matings will apply at 48p per mile. Invoices will be raised after the first mating. Please contact us for details. 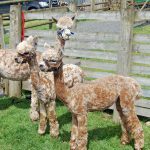 All services come with a live 48 hour cria guarantee. Should the cria not survive beyond this period then the female may return for a free service. Mileage is not included. We have our own ultrasound scanning equipment for pregnancy confirmation.